Seattle Smooth—or maybe her jockey Ramon Dominguez—gave her backers and her connections some tense moments during the running of the Grade II Shuvee at Belmont on Saturday. Stuck behind horses down on the rail at the top of the stretch, Dominguez seemed to be waiting for a hole that didn’t open up, and he finally swung off the rail into the four or five path. Clearly much the best, Seattle Smooth steadily gained ground once she found running room, and won by nearly a length.Not quite the way a 1-5 favorite is supposed to do it, but she got the job down. Following the race, trainer Anthony Dutrow indicated that the plan is to get Seattle Smooth a Grade I victory; she’s pointed to the Ogden Phipps Handicap on June 13th. Photo credit goes to Keith McCalmont of Triple Dead Heat and Down The Stretch, who joined me yesterday on his first visit to Belmont Park. He’ll be posting his impressions on his own site later in the week; we had a great day talking horses and talking racing. We handicapped well and bet badly; met up with Ernie Munick; and watched together Rachel Alexander’s win in the Preakness. I was relieved to see a post from him earlier in the day, as it means that he’s not lost somewhere on the F train, at which I deposited him Saturday evening. If you haven’t yet read the story that Maryjean Wall wrote about Calvin Borel, get on over to her site and check it out. “Yes, yes,” you’re saying. “Enough about Calvin.” I agree…except that she wrote this when she met him for the first time…when he was 14 years old! I used Musket Man in exactas on Saturday and for a while there thought that I might cash…not to be, but he may be moving close to “favorite three year old male” status. It’s a little surprising that his third-place finishes in the Derby and Preakness aren’t getting a little more attention, and I’m looking forward to seeing him this summer. Finally, belated congratulations to Mama and Papa Backstretch, who celebrated their 45th (!) anniversary on Saturday. Their 5/16 wedding date has occasioned many 5-1-6 trifecta box hunch bets from Mama B. (though I don’t recall her ever having cashed one), and they celebrated with dinner at the Wishing Well in Saratoga. I spoke to them shortly before Preakness post time; Papa picked the winner and Mama had the exacta, but neither of them bet it, proof positive that bad betting is a genetic trait. Also listed as possible are;CommentatorFormidableRiley TuckerThis One’s for Phil (3 yr. old)Should be agreat betting race – thoughts?? 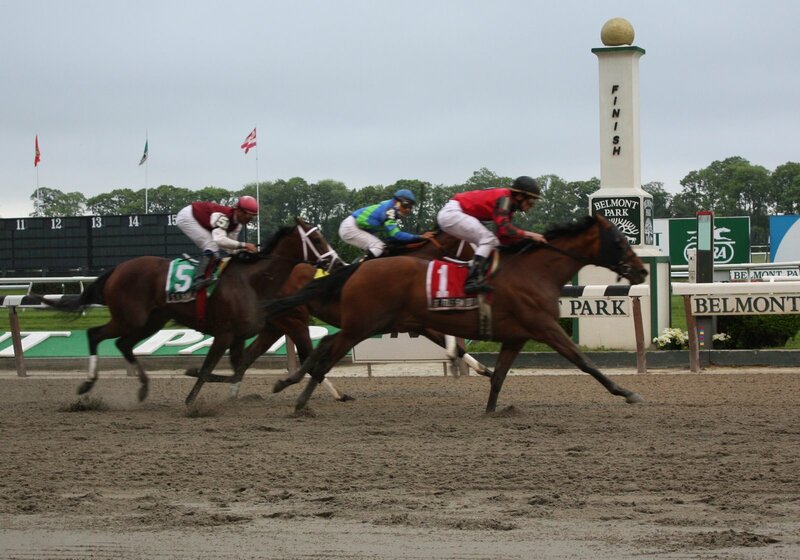 Brian will be back in a few days with a look at the Met Mile–thanks for asking! The Met Mile is one of my all-time favorite races…Looking forward to delving into it.For those that missed the Shuvee, make sure you go watch the video online. Jockey Jose Lezcano, aboard eventual third-place finisher Sea Chanter, gave one of the most brilliant “race-riding” displays you will ever see. And it was 100% clean. He kept an eye on the heavy favorite the whole way and kept her bottled up inside throughout the turn and early stretch but just got outrun by a better horse. It was a beautiful thing to watch and in this day and age when we just seem to talk about bad rides and bonehead moves this one deserves mention even though it didn’t result in the win. I was one of those nervous backers of Seatlle Smooth who was thankful for Belmont’s long stretch run. I singled her in my Pick 4 and hated to be beat like this. Brian is correct when pointing out the riding style of Jose L., and the NY colony is better than most at making their fellow jocks work for their wins. Seattle Smooth is one nice filly. How many times did Lezcano look over at Seattle Smooth? Every other stride, he had his head cocked to the left. Brian, have you heard any inside info on who may be actually entering this years Met Mile? I see you had one comment from Anonymous who had a list of probables – is that a good list? Does nayone know why Two Step Salsa and Gayego were not nominated to The Met Mile coming back from Dubai? I read somewhere that the plan was for both of them to run in the Met. The list anonymous put out looks pretty good to me, though Mr. Sidney, My Pal Charlie, and Ready’s Echo might be more likely to pass.Weights come out on Wednesday and I think that will give us a better idea who shows up. I’ll keep an eye out and get back to you if I hear anything more definitive.As for Two Step Salsa and Gayego, I would just think they haven’t done as well as Godolphin would have liked following the trip back from Dubai. We all know how strenuous that can be on horses and frankly, running in the Met Mile as your first start back is nothing short of extremely ambitious. I haven’t talked to Rick Mettee in a bit but throwing it out off the top of my head (and a complete speculative guess) I would think True North and/or Tom Fool would be likely places to see either or resurface for the first time. The owner of My Pal charlie is also the owner of Big Drama and in an interview on tv on Preakness day he mentioned that PAl was going to run in the Met. So that may be correct. Mott said in a BH article that Mr. Sidney was going to try the dirt in The Met as well. Like you said after the weights come out Wed. we should know more. Do you think the 3 year old Mr. Fantasy will run and if yes can he compete with this group? I assume he will probably get 109 -110 pounds, right? I’m sure Team McLaughlin will line up Mr. Fantasy. They have said all along this was the major goal and bypassed the Preakness because of it.He’ll get in light too, and this isn’t shaping up as the deepest Met we’ve ever seen. But when I think of 3yo’s running huge in the Met Mile I think of Holy Bull and Honour And Glory, and as nice as Mr. Fantasy may be, he’s not anywhere close to being in that category (at least not yet). He reminds me a bit of Richter Scale, who ran fourth in this race as a 3yo back in 1999 (don’t quote me on that year).Also, My Pal Charlie is owned by B. Wayne Hughes while Big Drama is a Harold Queen homebred…I didn’t see the telecast on Saturday, but unless something has changed, the two owners aren’t the same. Brian – sorry meant to say Albert Stall the trainer of Terrain and My Pal Charlie was intervied and said My Pal would run in The Met. Agree with you on Mr. F. not sure why they selected The Met and not the Woody Stephens. Does the weight make that much difference? what jockey can they get to ride at a 109-110 weight anyway? Honestly, I pay little to no attention to weight. But you do bring up a great point as far as if he gets such a light impost who can even make the weight assignment?Just judging off the top of my head with the list of potential runners…it’s going to me mighty tough to win this Met Mile on or close to the pace. Right off the bat you’ve got Driven By Success, Commentator and Mr. Fantasy who all nead to be mixing it up early. And if Riley tucker, Formidable and This One’s For Phil all go you won’t want to light a match at Belmont on Monday afternoon.Bribon anyone??? ok – just spoke with the Racing office got this info on who they think will run in the Met Mile:AccreditBribonDiscreet TreasureDriven By SuccessMr. FantasyMr. SidneyReady’s EchoRunforthedoeSmooth AirThe RoundhouseThis One’s for PhilNow we have something to work with (albeit without the weights yet). Gotta believe Bribon will be the M/L favorite like you mentioned, but wouldn’t be surprised to see Mr. Fantasy and/or Smooth Air a close second choice. Yikes, that’s not dad’s Met Mile to be sure. Thanks for doing some homework on it too. And you’re right on Mr. Fantasy, he’ll take a boatload of money, like all McLaughlin horses. So what’s up with this field – sure doesn’t seem that strong. Or am I missing something? A 3 year old has not won this race since Honor and Glory in 1996 and what a race that was. take a look on youtube. Might be a year for another 3 yr old to win it. Can’t take Mr. F if he is chalk though. I think he actually turns 3 on May 24th!! Honour And Glory was one of my all-time favorites, his Met was nothing short of sensational, especially when you condsider he set the pace in the Derby just weeks before.It’s a poor race in terms of true quality, but it might be a really good betting race and seems wide open. Dicreet Treasure is getting good (finally) and had no chance in the Westchester…moght be the right price too. Excuse me for butting into your Met Mile conversation, but what has Mr Fantasy done wrong except find himself in a Match Race w/I Want Revenge. And had that race been 8 panels, I think Mr F would have got the wire first.I like him in this spot. Very nice horse. BSaint – welcome aboard – can use all the help I can get trying to figure this one out – I have a feeling we are going to see some good prices on some decent horses. This is a Grade 1 $600,000 race – and does not seem to be getting much respect from any of the “horse press”. The Preakness is over lets move on we have 3 weeks to the Belmont. Mr. Fantasy to me is smoke and mirrors. Right now his claim to fame is winning a few NYB races and a five-horse Withers where the runner-up had a nightmare trip.He’s also a 3yo with speed in a race that looks mighty quick early. Not to mention the barn gets absolutely pounded at the windows wherever they show up. If he’s 6-1 then sure, he’s worth a look, but at the 7-2 I could see him being you have to look around.Though the Gotham was at 8′ furlongs and he got crushed, beaten 8 3/4 lengths…if it was at just 8 he still gets drilled, just not as much. He was already 2 lengths behind in midstretch. Brian, in the Gotham you are correct re Mr. F. However, to be fair, he also beat the remaining 9 horses (which at the time was considered a pretty strong field) by about 7 lengths. Also the winner, IWR ran 0 on the Rag sheets which is amazing. But I agree at 7/2 I will lay off of him as well. Would not shock me if he wins it though. He beat 4 pretty good horses in the Withers – for sure it was a small field. Plus i respect the Mig’s opinions as well. He was pretty high on him and wants to be on him whenever he can et the mount. I think Accredit needs to hope it rains 13 inches and they shorten the race to 7 furlongs furlongs in the next five days to make an impact.Bribon has to hit hard in here, and at least prior to looking over the Form, I’ll say Discreet Treasure seems set to run well.If Smooth Air wants to win I’ll be estatic…He’s a really cool horse who gets no repsect but has certainly put his time in over the past few season and done little wrong.As for odds, I would think Bribon is in the 5-2 tepid-range and Mr. Fantasy is somewhere around 4-1. So I guess you don’t like my Accredit choice. Weather is suppose to be perfect all weekend so the 13 inches are out and I have to belive they will keep The Met Mile at a mile. i hera you. We shall see. If Mr. F goes off at 4-1 I’m all over him with win bets. Looking at the field and weights, no way he goes off at 4-1. Just teasing a bit on Accredit, but he’s done nothing on a fast track to suggest he can compete in a race like the Met. Of course, he’s in new hands now so you never know.I’m just not a fan of Mr. Fantasy in general, so at 4-1 in a field of decent older horses, several with speed, I’ll take a strong stand against him.Looking forward to handiapping it over the weekend and thanks for all the posting you’ve done on the potential field and the weights! Assume you saw the story that we may get 15 entries for the Met Mile – when’s the last time that happenned? Can’t figure out why nore “top names” did not enter. Grade 1 $600,000 ???? Ok now you have the post positions for THe MEt Mile, what do you think?